Habit: Cespitose to rhizomed; (dioecious). Leaf: blade 3--6 mm wide; sheath front red-dotted, occasionally cross-wrinkled. Inflorescence: open or dense, 2.5--15 cm, 1--2 cm wide; spikelets >> 10, > 1 per lower node or branch; spikelet bracts obvious; pistillate flower bract +- >= peri, awned, +- white or margin wide, white. Staminate Flower: anther > 1.9 mm, awn < 0.1 mm. Fruit: 1.5--2.5 mm, 1--1.3 mm wide, ovate; peri 3--4.5 mm, 1.4--2.1 mm wide, body ovate to deltate, tapered or abruptly narrowed above, gold to dark brown, veins abaxially few, adaxially 0--few, wall rounded over fruit, filled with pithy tissue below, beak 0.6--1.4 mm, serrate or ciliate. 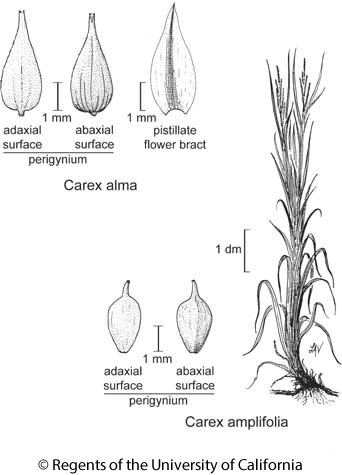 Citation for this treatment: Peter F. Zika, Andrew L. Hipp & Joy Mastrogiuseppe 2015, Carex alma, in Jepson Flora Project (eds.) Jepson eFlora, Revision 3, http://ucjeps.berkeley.edu/eflora/eflora_display.php?tid=17232, accessed on April 19, 2019.
c&s SNH, Teh, SnJV, SCoRO, SCo, TR, PR, DMtns, DMoj; Markers link to CCH specimen records. Yellow markers indicate records that may provide evidence for eFlora range revision or may have georeferencing or identification issues. Purple markers indicate specimens collected from a garden, greenhouse, or other non-wild location.